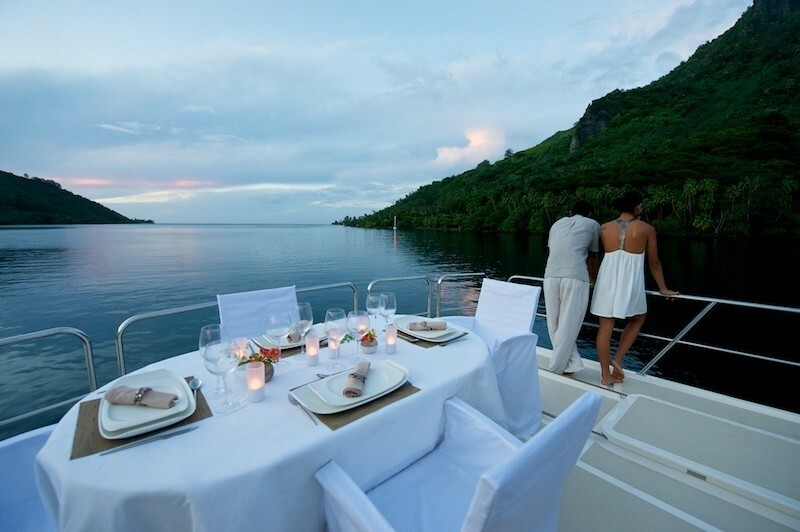 Luxury motor yacht MISS KULANI is a brand new Marlow Explorer built in 2010. 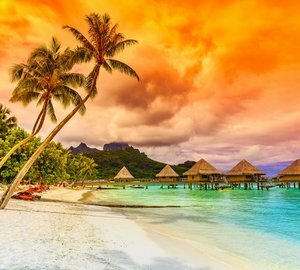 This luxurious vessel is the newest yacht to be based in Papeete, Tahiti year round. 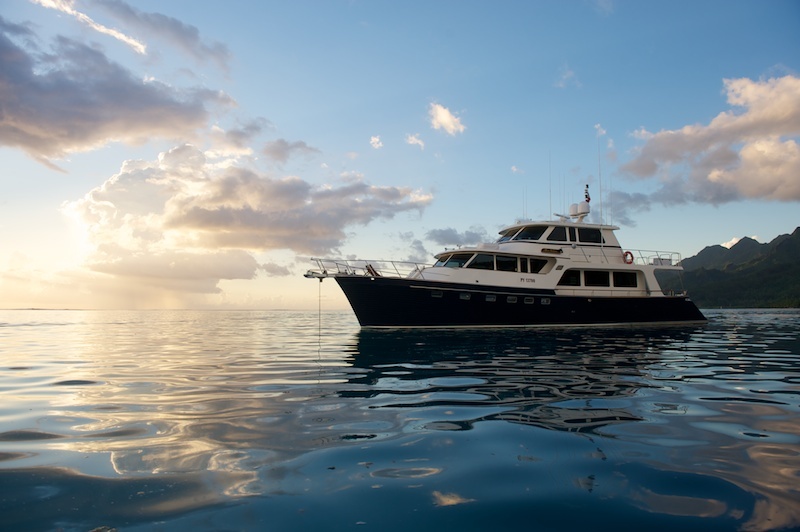 Luxury Marlow explorer MISS KULANI has a beautiful interior featuring a Holly teak flooring throughout. The main deck is open, airy and light. The main salon features a settee to Starboard with occasional chairs to port. 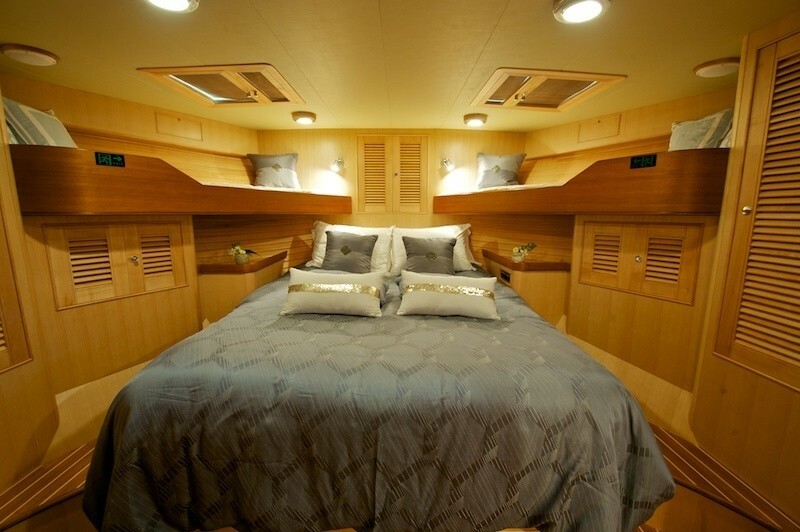 Further forward on the port side there is a built-in hidden sink, fridge, and icemaker. On the starboard side there is a bar with stool seating for 3. The entertainment system in the main salon features surround sound, a 50” retractable TV/DVD and an iPod docking station. Forward of the salon there is a small staircase leading to galley and informal dining area. 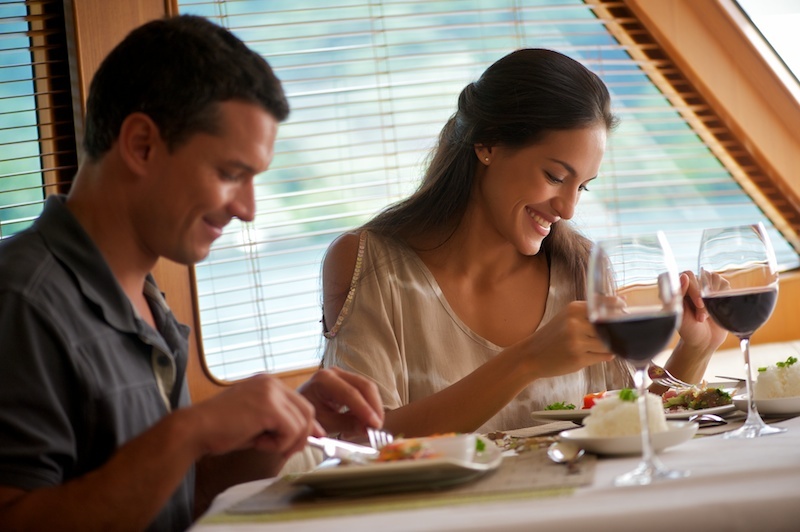 The galley and dining area features an informal wrap-around settee dining for 8. The table has extra leaf to pull out allowing more space. 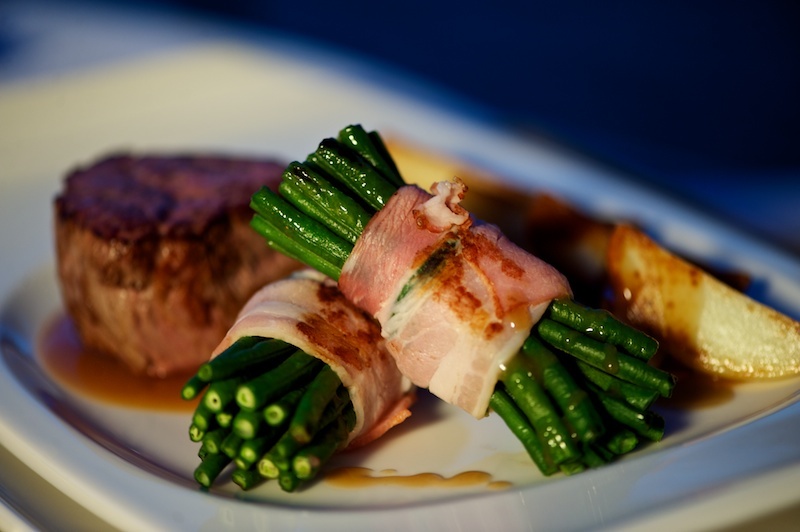 The “Country Kitchen” style galley offers amazing panoramic views forward and produces fine cuisine to enjoy throughout your charter. 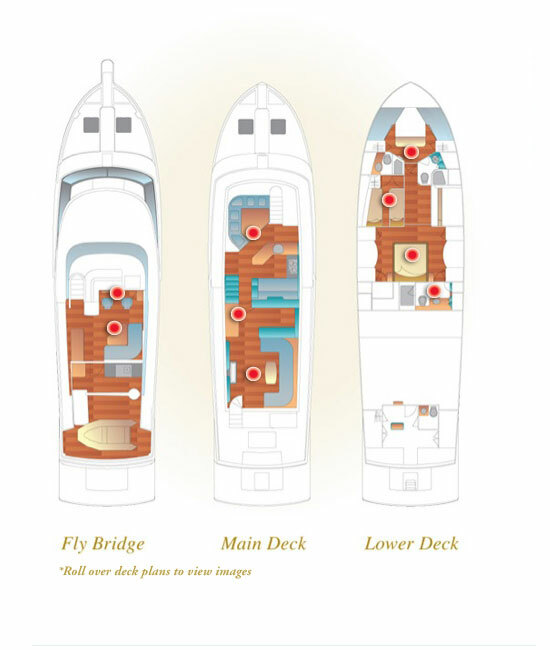 There is a staircase to Bridge, along with access to Bow and staircase forward to guest accommodations directly below. 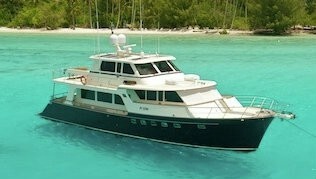 Motor yacht MISS KULANI can accommodate 6-8 guests in 4 staterooms. 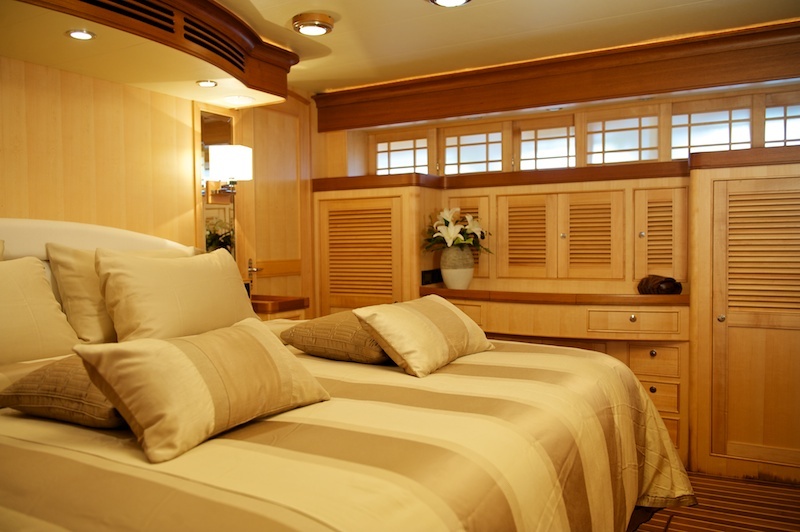 Her Master Stateroom is located below-deck forward with a walk-around king bed, Cedar lined hanging lockers with auto lighting, vanity with pop-up mirror with light. There is a 50” TV and Japanese screen shutters in the portholes. The en-suite bath features sink and shower. 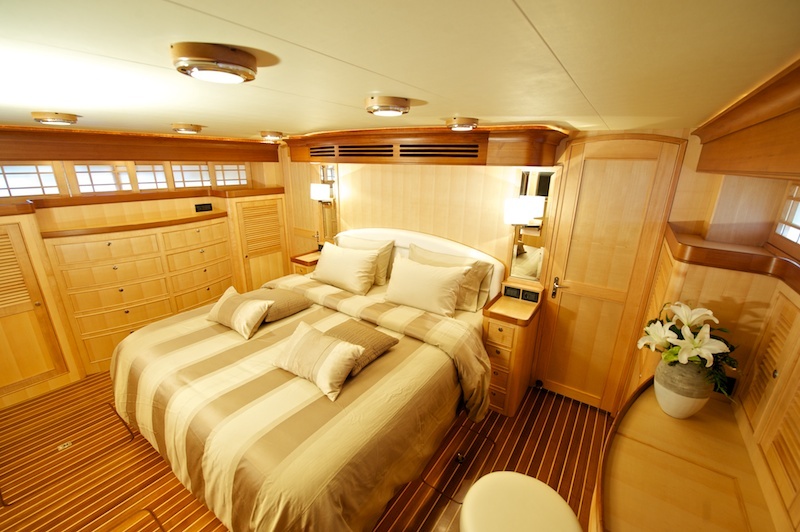 The Guest Stateroom forward offers a Queen size bed, plus 2 built-in Pullmans (for smaller children only). Cedar lined hanging lockers with auto lighting. There is an 18” TV and 2 Skylights. En-suite bath features sink and step-in shower (this bath has a 2 door access). 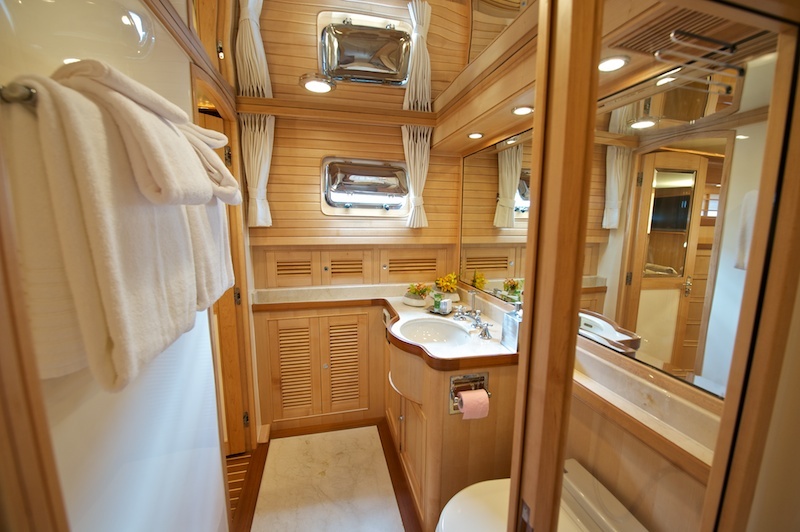 The Guest Stateroom forward to Port features Twin beds, Cedar lined hanging lockers an 18” TV. En-suite bath features sink and step-in shower. Shares bath with the forward to Starboard Stateroom. 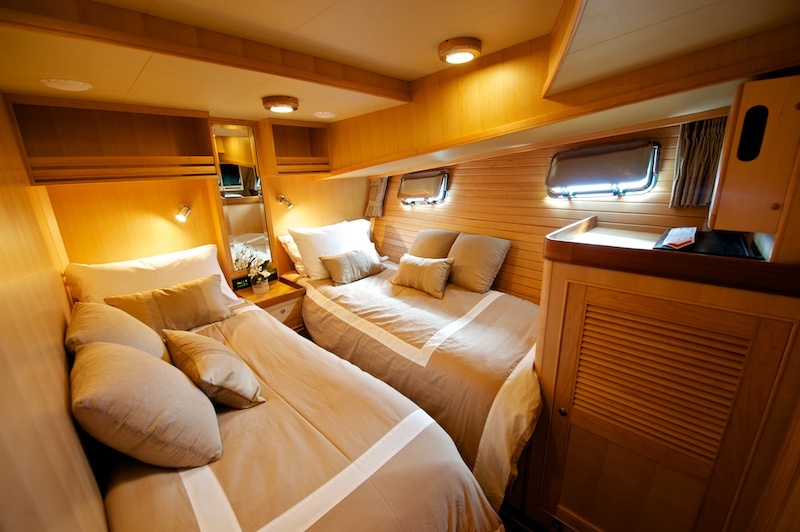 The final Guest Stateroom located forward to Starboard has upper /lower Twin beds with an 18” TV and shares ensuite facilities. This stateroom is better suited for children. 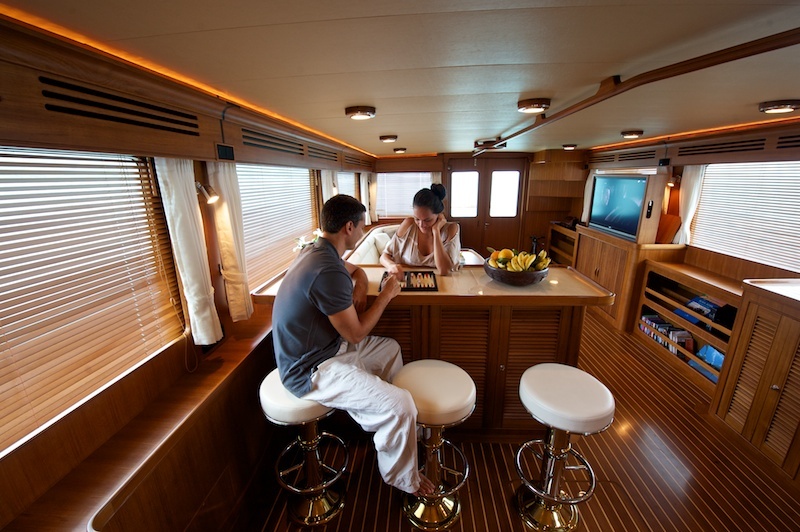 Explorer motor yacht MISS KULANI offers a great aft deck that is shaded with 2 built in settees. From the aft deck, there is access to the Bridge Deck and the swim platform where there is a fresh water shower and rod holders for fishing. 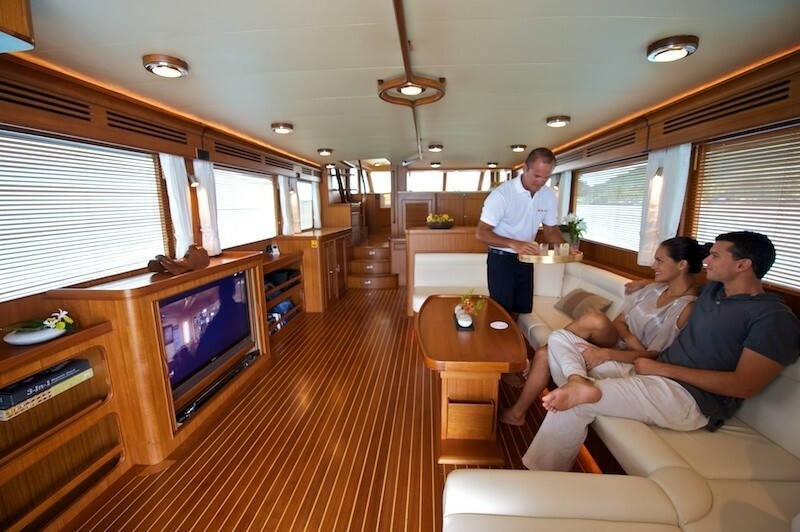 The Bridge area is a Guest-friendly with an informal wrap-around settee with adjustable table so you can enjoy watching the Captain navigate first hand. 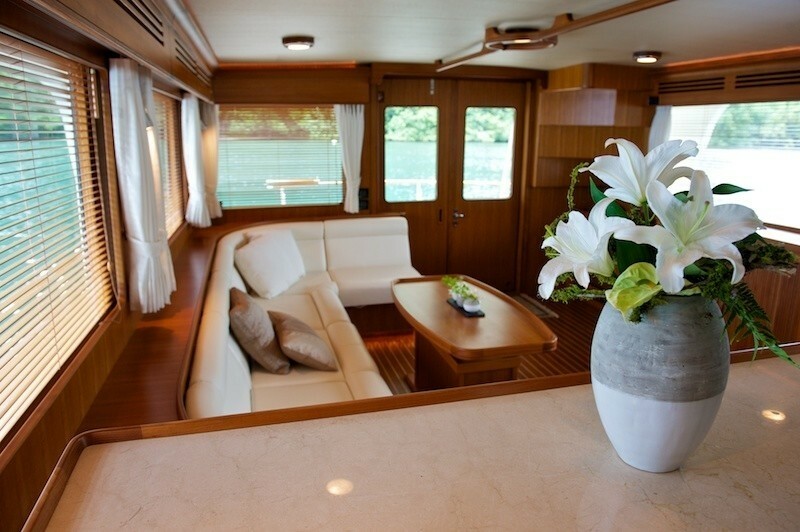 In the Bridge area there is also a wine cooler, built-in hidden sink, fridge and icemaker on the Port side. From here there is also access to bow where there is 2 lounge chairs. 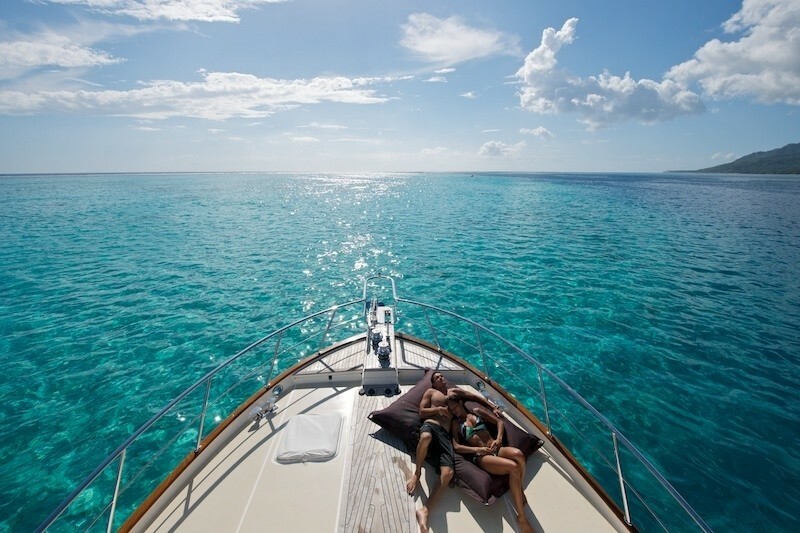 The Sundeck onboard motor yacht MISS KULANI offers ample sunning area with 2 lounge chairs. There is a Miele electric grill and a hidden sink. 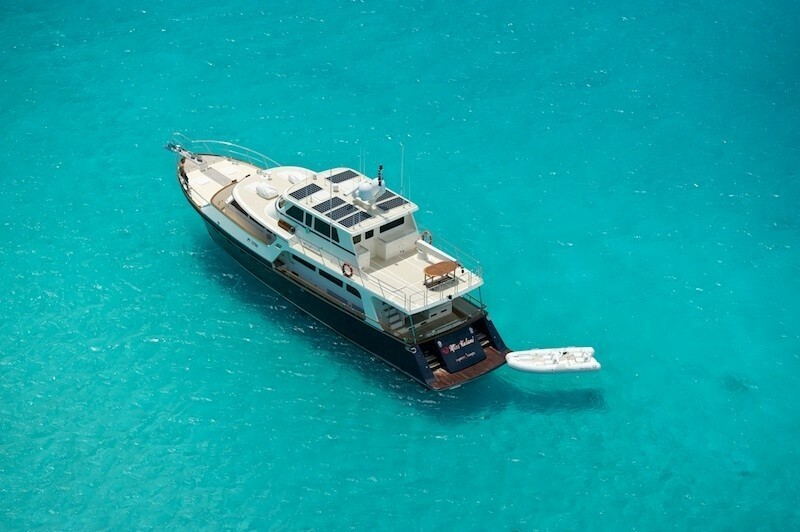 The Solar panels above that help with the air-conditioning make MISS KULANI an eco-friendly yacht. The Tender is also stored on the Sundeck. 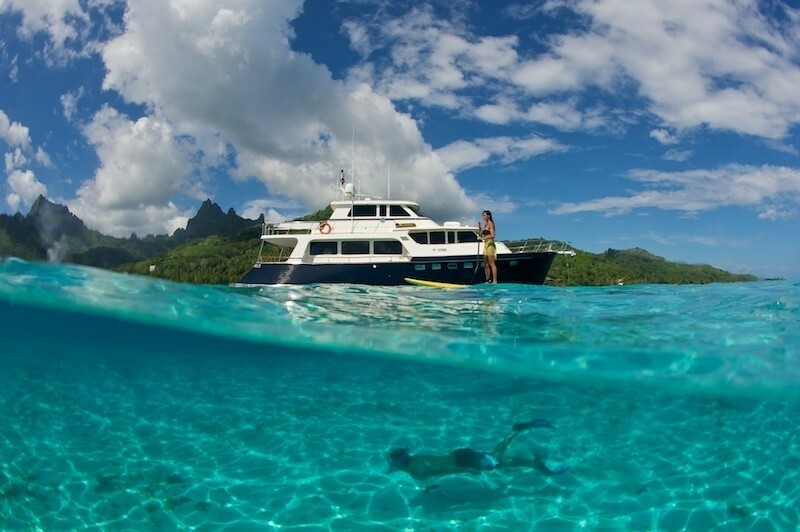 M/Y MISS KULANI has a crew of 3 and charters in the idyllic waters of Tahiti, based in Papeete year round. She can attain speeds of 22-26 knots. 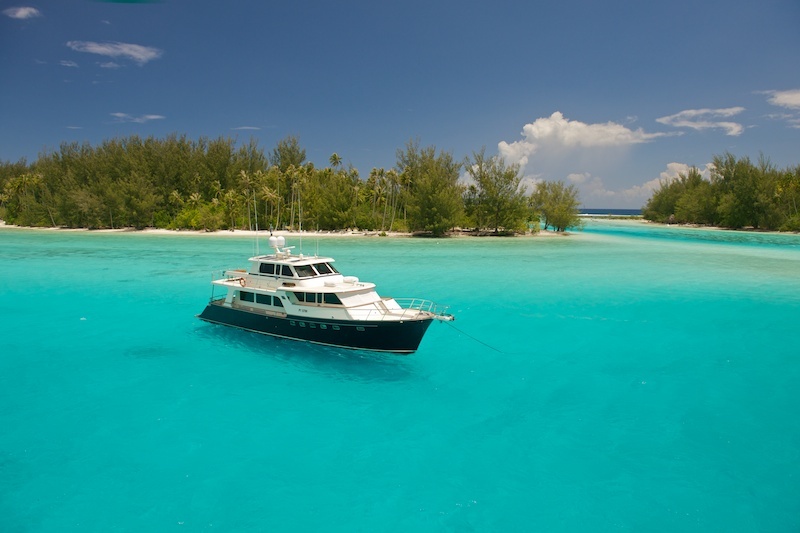 The Marlow Explorer motor yacht MISS KULANI has a great range of extras including the following Tenders & Toys :A 14’ semi rigid keel Tender 40 hp Jet Boat, Light fishing gear, Water-skis, a Wakeboard, Towables and Snorkelling gear. 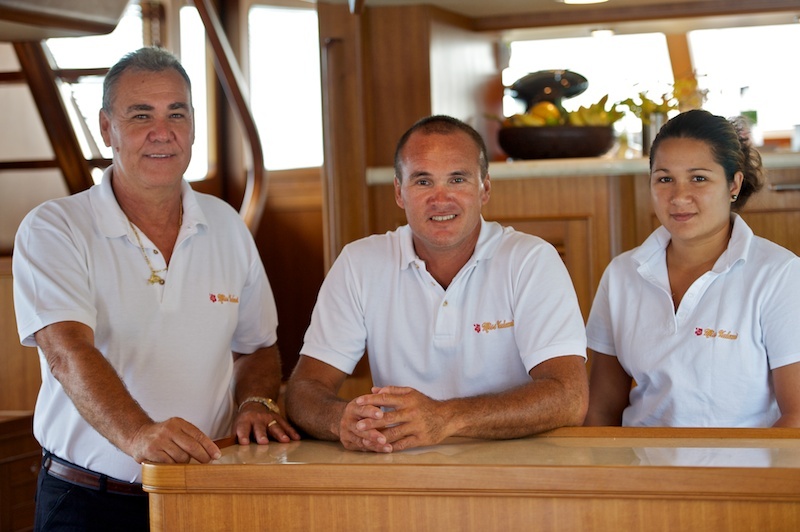 Communications onboard yacht MISS KULANI includes Satellite communications, Computer, fax, scanner, and printer internet for guests to use, Wireless internet. 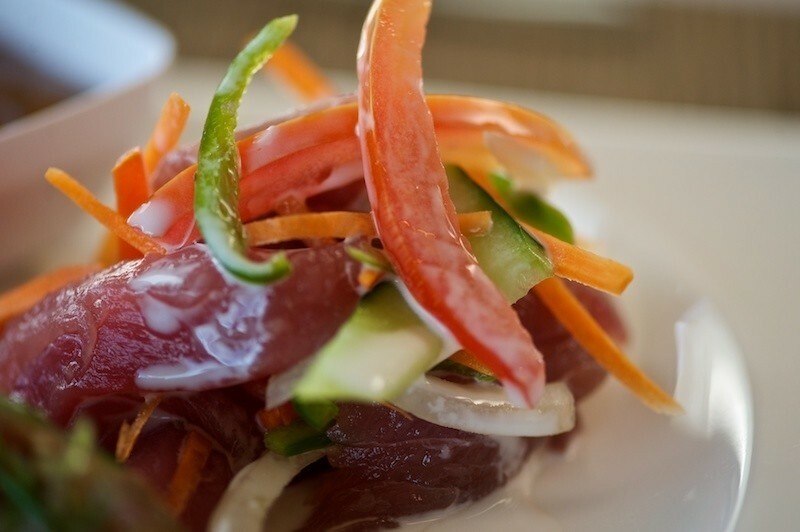 Audio Visual Equipment and Deck Facilities include surround sound, 50” retractable TV/DVD, iPod docking station in the Main Salon.